Creative! Fun and well executed! Only a thing, perhaps would be better to control the shield with the scroll and activate the shield with a click. Simple idea very well executed. This game is really addictive. Neat twist on a normal twin stick shooter. I really like that your shield isn't just a straight reflection, but that you have to time the reflection/parry. That said, I definitely had bit of trouble getting the timing down on the parry window - but maybe that just comes with more play. I like the concept! 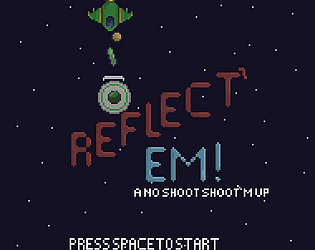 Maybe there should be an entire shooter genre about reflecting bullets, haha. The sprites and the song loop work well also. Really cool concept, and good music. I think some control tweaks could make it a bit easier to handle. Like if you could have the shield point towards a mouse cursor and parry by clicking. Thank's for the feedback !! After I realized that I could get enemy ships to shoot each other (and I could parry some bullets to other ships), I started having a lot of fun. Still felt a bit abrupt difficult-wise for someone who doesn't usually play these types of games.